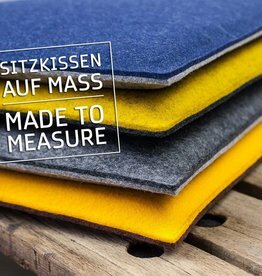 Felt cuts - felt on measure for your personal project. We manufacture your felt cuts in almost any measure in 0.5 cm increments. Your felt cuts are made in 5mm felt thickness. We manufacture felt seat pads or bench pads in special dimensions for benches or unusual seating furniture with pure new wool. Your bench becomes a cozy place with a modern and puristic look in your home with our felt bench seat pads. Felt cuts make benches more comfortable and also turn chest benches into comfortable, soft seats. Made-to-measure felt benches are also very popular at the dining room bench, beer bench and rest benches. Felt seat cushions according to your wishes are also increasingly used in the trendy high bench, which represents a new type of benches. The felt undersides can be secured against slipping with rubber coatings made of natural latex. Use the felt cuts for example as a felt table runner in your desired measure or dimension for decoration and thus create a cozy, individual home with the simple, high quality look of wool felt in the thickness of 5mm. Choose the felt cut from 20 great colours. 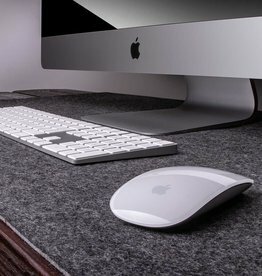 Work comfortably on a soft felt desk pad and place your laptop, keyboard or PC on wool felt in your special size. 20 great colors and the high quality felt makes working, designing, browsing or playing at the desk to a real pleasure. If it has to fit.